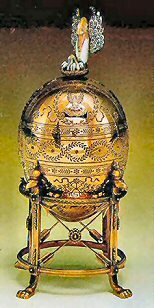 This was to be the page with the "Singing Birds", but as there are only four singing birds among the Imperial Eggs, Kelch Eggs and Eggs of "Imperial Quality" and all four are already on the Automatons Page, I decided to put all beautiful birds together on this page. 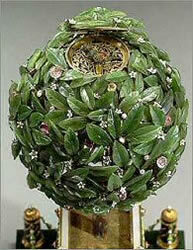 If you want to hear how an Egg bird sings, watch the little movie of the 1902 Rothschild Clock. The bird sings at the end of the movie. 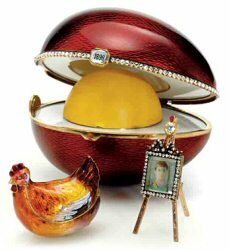 The Eggs with the Singing Birds, that realy sing, are the 1900 Cockerel Egg, the1902 Rothschild Clock Egg, the 1904 Kelch Chanticleer and the 1911 Bay Tree Egg. 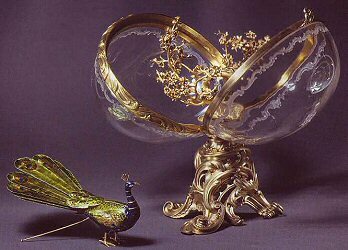 The 1906 Swan Egg contains a bird, for a swan is a water bird! This bird does not sing, but it can walk, spread its wings and wag its tail! 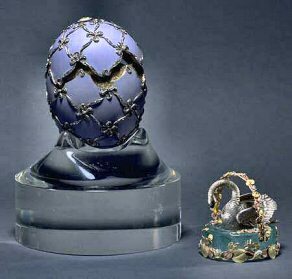 Another famous egg, the 1908 Peacock Egg, contains a beautiful bird, which when wound up, walks and spreads its tail feathers - its beauty is timeless even after 100 years! 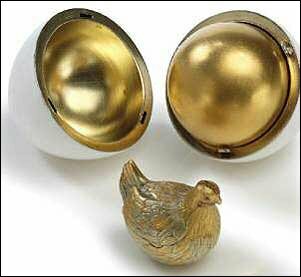 There are the two little doves in the 1910 Colonnade Egg, and Imperial Eagels there are serveral on the Eggs made for Tsarina Alexandra, but as those Eggs have other "themes" they are not present on this page.